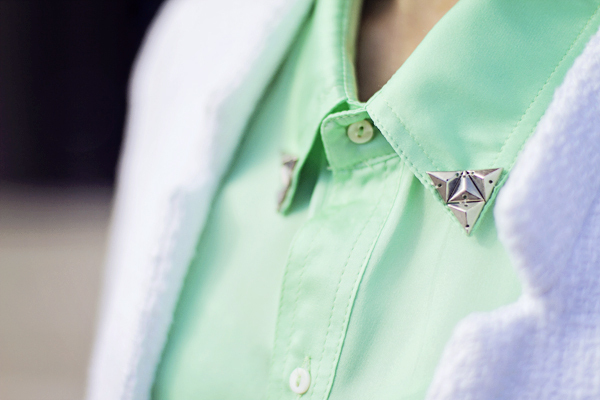 I love how the mint green studded collar Line & Dot shirt brought life to this monochrome outfit. The shirt is actually sleeveless and very light (thanks to its silky texture), so it goes perfectly under a blazer. I'm slowly returning back to the blogging world with more outfits to share. Reading your comments made me realize that most of you are excited about outfit posts more than about any other posts so I promise to improve that part of my blog. Of course I'll keep posting pictures of other things that inspire me but I definitely will work on the documenting my everyday looks more often. Sounds good? Fabulous pants and blouse! You look great! Gorgeous blouse, that color really suits you! Мне нравится цвет рубашки! Тебе очень к лицу! Coollook! Love it! And yes it sounds great your new improvement!! Very nice! Love the colors, they look so good together! Lovely soft colors. Love it dear! Gorgeous, and feminine! I love that colour! Absolutely amazing! Love it all together! Fabulous outfit! I love the blouse and those jeans. I honestly just love about anything you post in this blog, your photography just makes me so happy. I love the blouse and jeans. So cute! Amazing outfil!! Love the jeans. I just saw you were featured on Lauren Conrad's blog! Congrats that's wonderful. Also this look is just so gorgeous. I just love how that green top softens up your pants. It looks wonderful! I love the combination of the soft green with the hard studs! Looks great, and this outfit is fantastic!! Great blog :) hope you can check mine out!! Looks very nice on clothes. I decided to really love the physics of style and weight loss. 8-9 thanks to weight loss.